inniAccounts’ payroll features are completely automated: payslips and PAYE payments are calculated for you automatically. Here’s what you’ll need to do. Do you pay yourself on an ad-hoc basis? If you prefer to pay yourself on an ad-hoc or irregular basis – for example when you complete a large project – you’ll need to pay particular attention to your automated payroll settings. Please click here for more details. It’s important to log into inniAccounts and preview your payslips before each pay day. You should check the salary, expenses and mileage payments for each of your employees and change them if required. Find out more here. Once your payslips have been created they will be submitted automatically to HMRC, which means they cannot be edited or deleted. Therefore it’s important to preview your payslips and check them ahead of pay day. 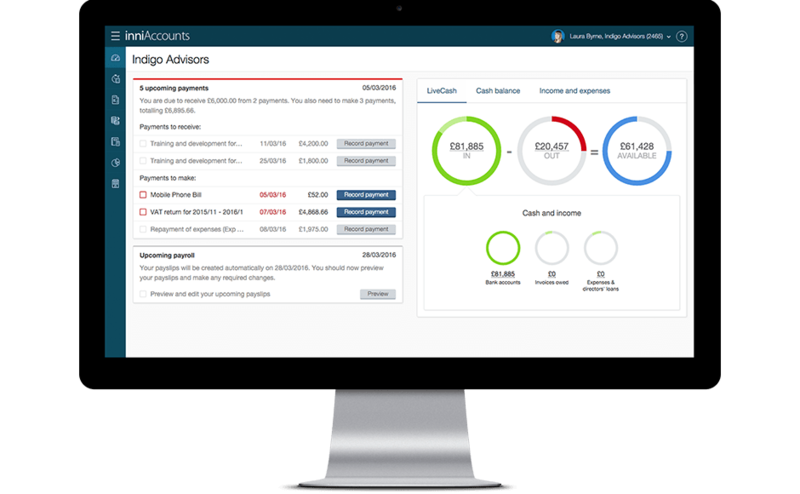 inniAccounts will automatically create and issue your payslips on pay day, including sending an electronic copy to HMRC. Once your payslips have been created we’ll send you an email detailing how much you should pay to each employee. You should then log into inniAccounts, give each employee a copy of their payslip and transfer the net payment from your business bank account to their personal bank account. Every quarter (or month for some companies) you’ll need to pay HMRC any income tax, National Insurance and student loan repayments that you’ve deducted from your employees. We’ll send you an email when the payment is due, along with full payment details. Find out more here.